Put on some slightly rose-colored glasses - maybe round ones, maybe some that look like they're left over from the 60s, maybe put a flower in your hair, also - and you'll get a truer idea of the color of this tree. Maybe even listen to this song to get you in the proper mood. It's summer out there & this is my very favorite summer tree & the color isn't quite right when I post it here, but I know that y'all understand this tree even so. It's a summer tree. 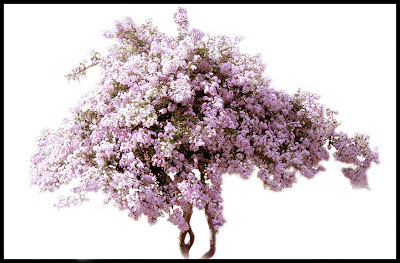 A crepe myrtle. There are others all over the neighborhood, all over the area - dark pink, white, fuchsia, purplish, even true lavender. This tree is on the block behind my house. I wait every year for it to bloom, then backtrack around the block just so I can see it. My friend Theresa lives next door to this tree, which shares its yard with hydrangeas, moonflowers & a darker pink crepe myrtle. The tree's owner once expressed to Theresa that perhaps she (the owner) was owed a little something in exchange for having such lovely flowers for Theresa to gaze upon, so Theresa promptly baked a batch of brownies & offered it as a fair exchange. It was accepted. I have another 3 days off this weekend. I am hoping to not think about art, which no doubt will insure that I do. I want to just eat some cherries (thanks Robin! ), lay at the lake & read a fun novel, drive around NE Texas on a photo safari with no time when I have to be anywhere. I need a break to feed my inner artist, to give her some time off, to let her just look at things without feeling she has to do something with those things. To just put on some rose-colored glasses & dance in the street. You may hear an anklet or two jangling. Yes!!! Anklets jangling, camera rolling, life whizzing by and you just hangin out with it. I like the tree, and had always wondered what they were called. Thanks for the info! Brownies for tree gazing? Fair trade I would say!! Good evening, my dear fellow tree hugger! I just love the trees you find...and paint. I will be doing the same thing...a good novel, some fresh fruit and a big body of water, except mine will be salt water. Will be thinking of you. Have a wonderful time relaxing! But stay out of that hot sun!!! Gillian & Jaime - I just waltzed in to feed Miss Lily & my sister-in-law showed up with my VERY FAVORITE homemade (even to the actual picking of the apples) apple pie that she makes just for me - with lots of lemon for tartness. A whole warm pie sitting right here in front of me, and, well, I couldn't resist - I started eating right out of the pie plate - no slicing, no etiquette, no one watching, so why not? Also waiting for me was a huge bucket of homegrown tomatoes, squash & cucumbers - a gift from Joe here at work! A great start for my days off! I am visualizing cream peas, maybe some extra vinegary potato salad, tomatoes & okra. Oh. And then more apple pie. I will be as fat as a butterball by Monday! let me know how the novel turns out. I have thought of reading it, butI like quick fun reads. lovely wonderful image and story! hey, that's a stunning tree (i love trees) and your plans sound great to me. Michelle -I've read this novel several times. It's so good that you'll be glad there are 4 or 5 sequels to it. Truly. Tammie Lee & Polona - thank you. It's a gorgeous tree! like you? really really like you? well debi we all really, really like you... yes we really do!! so somehow i skipped this post you had and am back to not miss a single word of your blog. the summer tree you have here is lovely vision. so your three day weekend is way past and you have undoubtedly shifted out of butterball mode. what no cherries?.... apple pie in summer isn't even heard of here. we have to wait until like october for apples! i'm just sayin'....we really, really do like you debi. The apples may be from last fall - I don't know. I think she gets them from a tree near her mother's house & maybe cans them? Can you do that with apples? Can you tell I know nothing about cooking?